Fellow Beasts! 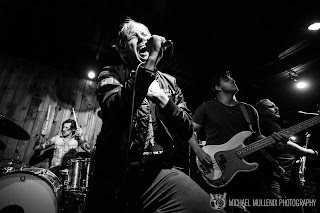 Celebrating 20 years of being a band, Thursday took over two nights at Austin's Barracuda Club last week for the full play through of 2001's Full Collapse and 2003's War All The Time. These two albums are separated by only a short period of time but are immensely different, drawing strengths from divergent song-writing methods and emotional energies. Watching them performed back to back and getting to witness the feverish vigor of the Full Collapse crowd vs the pitch-perfect harmonies of the War All The Time crowd drive this point home splendidly. Anthems like Division Street, Cross Out The Eyes, Signals, and of course Understanding In A Car Crash made this an impressive pair of nights to seek out music in Austin. Without further ado, it is my pleasure to welcome to our magazine, THURSDAY!